Scientists for the Mekong is a group of Experts who offer their services for free to be the VOICE of millions of people in SE Asia, who are unable to defend their Civil Rights to Food and Water supply. We are especially concerned with the impacts of the rapid development of Hydropower projects taking place in the Mekong River Basin. These Dams are putting at Risk the Food Security & Water Supply of 60 Million poor people in Thailand, Laos, Cambodia & Vietnam. 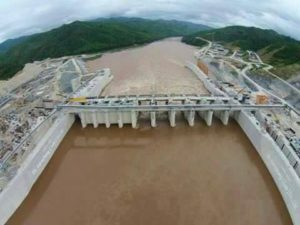 The construction of a cascade of 11 Hydropower Dams on the main stream of the Lower Mekong River, and hundreds of Dams in its main tributaries, is taking place at present in Laos and Cambodia. 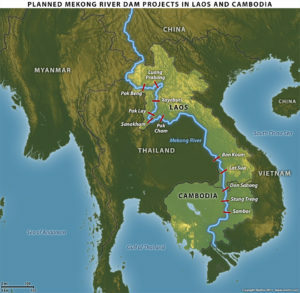 These projects are: jeopardizing the viability of these river ecosystems, ruining the fisheries, leading to loss of biodiversity, decreasing the fish supply on which 85% of the communities depend for their survival, increasing poverty, leading to the sinking of the Mekong Delta, and creating an unnecessary Humanitarian Crisis. If all Dams go ahead as planned by regional governments – in favor of Trade Agreements, this will result in up to 7 Million people in the Mekong Delta of Vietnam being displaced from their lands and becoming “Environmental Refugees”. The frenzy of Hydropower Development in the Mekong Region is led and funded by China, in its push for Supremacy and Control of the region. Thailand and Laos are also main beneficiaries of these investments. But downstream Cambodia and Vietnam are the BIGGEST LOSERS. Under the tutelage of China, the Government of Laos has already started construction of the Xayaburi Dam (60% complete) and the Don Sahong Dam (in January 2016) on the main stream of the Mekong River – without the consent of neighbouring countries that share the same river resources, and despite their strong opposition. Laos is now preparing the ground to start construction of a third illegal Dam, the Pak Beng Dam. Emboldened by the support of Australian Oxfam & DFAT, and with the financial help of China, both Laos and Cambodia have recently announced they will increase the number of Hydropower Dams to be built. Laos recently announced it will build a staggering 350 Hydropower Dams for the country (!) This includes the 7 additional planned dams for the main stream of the Mekong River. Cambodia is planning 2 Mega-Dams on the main stream of the Mekong River. The Sambor Dam will be the largest of all Dams and the most dangerous, as it will be built on unstable soil. Recently, Cambodia announced it will build 14 Hydropower Dams. Other dams are also being built and planned for major tributaries of the Mekong in Myanmar. Hydropower Dams and their reservoirs have been built on the Violation of Human Rights of affected communities. That is, through the lack of Free Prior Informed Consent, the forceful displacement and relocation of the poorest riparian communities, and the substandard quality of relocation village sites. 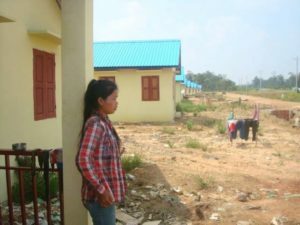 Although communities may be offered “nice houses”, sometimes a school and even a clinic, the land they receive is barren and unproductive, so they cannot cultivate food. Produces “Green Clean Energy” – an alternative to fossil fuels. This is a proven fallacy. Hydropower Dams have effectively INCREASED poverty and REDUCED the quality of life, the standard of living, the level of nutrition and mental health of affected communities in SE Asia and worldwide. Poor riparian communities are forced out of their lands, i.e. they are “displaced and relocated” to make space for the reservoirs of the Dams or because they are immediately downstream from the Dams. Except in the case of the Preah Rumkel Community in northern Cambodia, which has been left unprotected and at risk. Preah Rumkel is located only 1.5 Km. downstream of the Don Sahong Dam in Laos, yet neither the government of Laos, the Developer nor the Cambodian government have offered this community any alternative, compensation nor protection! In SE Asia, hundreds of thousands of poor people have been forced to invent new ways of surviving, which adds more stress and anxiety to the ‘new lives’ imposed upon them. This is despite the promises by governments that they will be supplied with alternatives or with training in new ways to make a living. Their livelihood is hampered by being commonly relocated 25km or more away from the river they love or from a natural water source. Ironically they often do not even have electricity – the very reason for their displacement. There is no compensation for loss of livelihood & cultural sites. As to Hydropower producing Green & Clean Energy, and being the “ideal alternative to coal and oil”, is absolutely FALSE! Studies conducted over the past 25 years on emissions by Hydropower Dams in Brazilian Amazonia have been discredited by the Hydropower interest groups and disregarded by the Intergovernmental Panel on Climate Change (IPCC). This is despite the findings showing that emissions from storage hydroelectric dams would exceed those from electricity generation based on fossil fuels. Dams are actually Methane bombs! This has been proven through 25 years of studies carried out in the Amazon Basin (similar conditions to those of the Mekong Basin). However, the Hydropower Industry and the IPCC refuse to act on this information, choosing to consider only the Dams builtin Temperate zones, which produce less Methane than those in tropical and subtropical areas. These are the issues ‘Scientists for the Mekong’ addresses and strongly opposes. “Scientists for the Mekong” is an independent group of highly qualified scientists offering a VOICE to the people of the Mekong River – who are unable to defend their Rights to Clean Water and Food Security safely. We are committed to revealing the truth on issues relevant to the Mekong River, and to protect the ecosystem itself for future generations. Help Protect the Mekong River Ecosystem – provider of the Food Security, Water Supply, and Livelihood of 60 Million people who depend on it – by opposing the construction of Hydropower Dams in the main stream of the Mekong River and in its main tributaries. Give a VOICE to the Communities of the Mekong, which are not allowed to oppose the construction of Dams, and whose demands are disregarded, in Laos, Cambodia, Vietnam and Thailand. Help reduce the damage to the biggest inland fisheries in the world. Help save the last 70 Irrawaddy Dolphins, which will be ‘sandwiched’ between the Dams and will certainly ‘become extinct’ in the Mekong River system. Help reduce Climate Warming by reducing the number of Dams built – which are constant sources of Green House Gas emissions, i.e. CO2 and Methane. Write and lodge Submissions for the protection of the Mekong River to Asian, Australian and International governments, agencies and organizations. As well, to offer suggestions to the Lower Mekong Governments on the ‘Best Management Practices and Conservation Strategies’ for the Mekong River and its tributaries. We call for International Assistance by Japan, the European Union and the USA – to help avert a Humanitarian Crisis in SE Asia. We call for an International effort to Pay Compensation to Laos and Cambodia for ‘Ecosystem Services’ – as an incentive to STOP any further construction of Hydropower Dams in the mainstream and main tributaries of the Mekong River. This will simultaneously help reduce in part the Hegemony of China in SE Asia. Otherwise, drastic and irreversible damages will occur to the Mekong River, its fisheries, the Tonle Sap system and the Delta. These in turn, will result in the Loss of Food & Water Supply, Loss of Land, and Loss of Livelihoods for 60 million poor people in Laos, Thailand, Cambodia & Vietnam. Where will the millions displaced by the Delta’s sinking and eroded river banks be relocated to? Climate Change will only compound an already severe drought from the North of Thailand to the Mekong Delta in Vietnam! 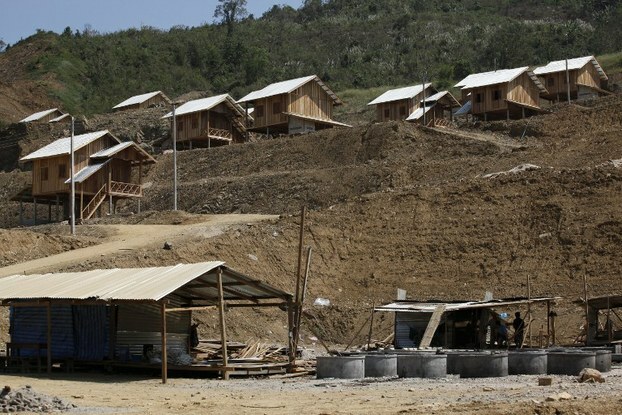 We also call on LAWYERS who are willing to represent the poor Cambodian Communities affected by Hydropower Dams – planned & in construction, and to take their case to the International Environment & Human Rights Court in The Hague.